Well it finally happened. As much as I had hoped and prayed we could go through the whole winter without it happening, it did. It first took hold of mi papa over the weekend and unfortunately, it’s now grabbed mi mama by its grasps and all hell has broken loose. What is it, you may be asking? Well, mi amigos, it seems mi mama has come down with a nasty cold. And by nasty, I mean, when she gets sick, things turn nasty. We tried to keep this from happening, we really did. When mi papa first began displaying signs and symptoms of his sickness, we tried to quarantine him to the bedroom and attempted to keep him as far away from mi mama as possible. The haz-mat suits were donned and the house was sanitized on an hourly basis. I made chicken soup and slipped Nyquil and Vitamin C tablets under the door to his room. And yet despite all these efforts, she still awoke this morning with the dreaded illness no one (especially me) wanted her to come down with. It’s not that I really mind sick people. Heck, they make the best laps to sit on due to their maintaining the same position for hours and sometimes days at a time. I don’t even mind the coughing and hocking of mucous so much either. What I do mind, though, is the constant whining and complaining and the complete lack of usefulness that generally seems to occur when some people are sick. And by some people, I specifically mean mi mama. Talk about drama. You would think she’s on her death bed the way she moans and groans and refuses to do anything other than lie on the couch watching reruns of Project Runway and Jersey Shore. All household chores cease to get done, there are used tissues and snot rags laying all around the house and dirty soup dishes in the sink. She wears the same crusty sweats and slippers for days at a time, and I’m pretty certain neither bathing of the body nor washing of the hair takes place during this week of fun either. Basically our home completely shuts down for the week and mi papa and I spend as much time as possible out “running errands” and “taking care of important business,” until things return back to normal and she starts to resemble a human being again. We’re currently in Day 1, so wish us some luck. And please do yourself and everyone you know a favor and stay as far away from our home as possible. Unless of course, you like watching crappy reality television with a stinky she-devil. Then by all means, come on over and take her off our hands for awhile… but be careful, she bites. Alright mis compadres, that’s all I’ve got for now. I just heard mi mama making some noise from beneath her blanket on the couch, and I’m going to try to find a place to hide before she grabs ahold of me to cuddle with her. 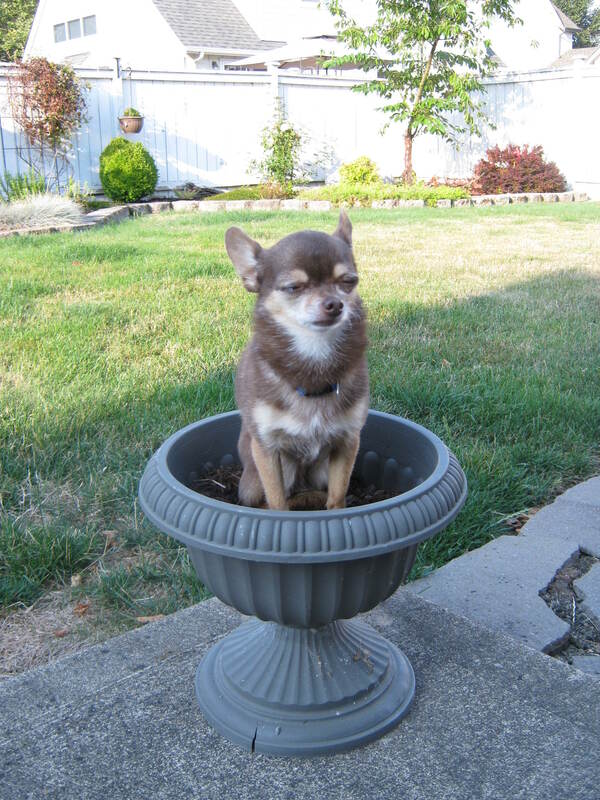 Maybe if I stay really still and keep my eyes closed, she’ll think I’m a plant. Ugh. That crap is going around, so just make sure your little canine immune system stays strong! Even if she acts like she doesn’t want you to curl up in her legs and hog the whole bed, do it anyway. She’s just not thinking clearly. Great recipe! Hopefully you are a fan of mustard because you won the Saucy Mama giveaway on my blog! And I hope your mama feels better soon and that you stay healthy! When you get a chance, send your address to pardonthedoghair@gmail.com and I’ll have Saucy Mama get the mustard in the mail to you. Holy frijoles! I’m so excited I won the Saucy Mama giveaway! I’m sure that’ll make mi mama feel mucho better. Gracias Lindsey!